Magic Leap One Creator Edition goes on sale. Magic Leap One Creator Edition is now available for purchase. 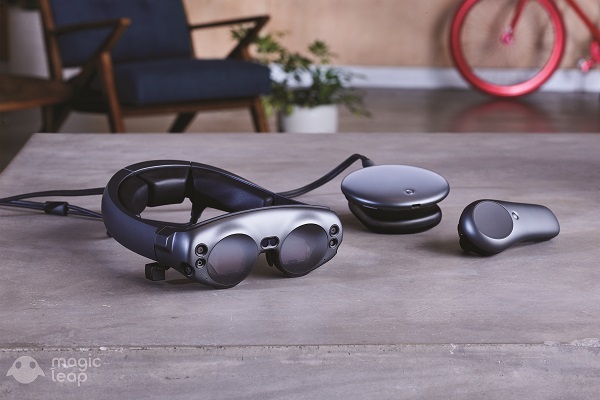 Magic Leap One Creator Edition is a spatial computing system that brings digital content to life. Its unique design and technology lets in natural light waves together with softly layered synthetic lightfields, enabling creators to build unbelievably believable interactive experiences and create worlds within our world. You'll have access to all-new applications and experiences, including a set of core applications that make up the foundation of Magic Leap's spatial computing platform. These include the Helio web browser that delivers 3D and spatial web experiences, the Screens video player that allows users to place multiple displays of any size in their physical space, and Magic Leap's unique avatars and Social application, offering a spatially aware way to connect, collaborate and feel presence across distance, with connection services powered by Twilio. Then there's LuminOS. It's a whole new operating system. One that gets the most out of Magic Leap's spatial computing platform by working in tandem with the brain. It's optimized for performance with a high-fidelity visual experience to turn your wildest imaginings into even wilder realities. Create, a playful sandbox mixed reality experience where anything's possible. Turn your house into an undersea world and watch sea turtles and jellyfish glide past, or stage a fight between a knight and a T. Rex on your coffee table. Paint, draw, build, and create in ways never before possible in this magical application developed by Magic Leap Studios. Dr. Grordbort's Invaders (coming soon), a hyper-realistic action game in which evil robots have chosen your living room to stage an invasion. Grab your ray gun and save the day in this larger-than-life, immersive video game from Magic Leap and Weta Workshop. Magic Leap One Creator Edition is available now starting at $2,295 USD and includes everything you need to start building. Inside the box you'll find the Lightwear headset, Lightpack computing pack, Control handheld input device, a Fit Kit to ensure a perfectly calibrated fit, chargers, and a handy Quick Start Guide to get you up and running. You can also add an optional fabric strap for the Lightpack. Right now, limited quantities are available to developers in cities across the U.S., with complimentary delivery, fit and set-up service provided using our LiftOff service. If shipping is not yet available in your area, you'll be able to make a reservation and be among the first to receive Magic Leap One Creator Edition when it comes to your city.